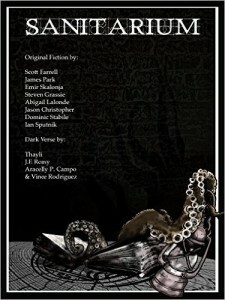 I’m delighted to announce that my new short story “Wiggle Room,” is available in Sanitarium Magazine Issue 33. “Wiggle Room” started as a story written around a simple premise: Write a tale about “creepy crawlies.” The resulting psychological horror story mixes some political doctrine, a Southwestern setting, and a couple of great characters – along with, of course, an army of creepy, crawly invaders who give the protagonist, swaggering, overbearing Senator Mason Grant, exactly what he wishes for. I had a lot of fun writing this piece, and I’m glad to see it has landed in a really top-notch horror publication. Sanitarium has published some truly fine horror, thriller, and dark fantasy authors, and I’m delighted to be listed among their contributors. Along with the collection of horror fiction, Sanitarium also includes poetry, interviews, and some magnificent (and often unsettling) cover art. Sanitarium is available in electronic format for just about every e-reader you can imagine. But I’ll warn you: Get your first issue and you may find yourself downloading lots of back-issues. It’s a fun, and creepily addicting publication!